Editor’s Note: Today we’re taking a look at a legendary essay on wealth-building by our friend Mark Ford. Many folks who read this essay call it an “eye-opener.” In it, Mark explains how to consistently build your wealth, even in a terrible economy. Mark has more insight into this than most. He’s built dozens of businesses from scratch… creating millions of dollars of wealth in the process. Mark knows more about building wealth than just about anyone. Today, he explains how you can gain financial independence… even if you think it’s too late. We baby boomers were told that if we worked hard and saved, we could spend the last quarter of our lives living comfortably and free from financial worries. Our parents told us. Our employers told us. Even the government told us. But now that we are reaching retirement age, the promise is beginning to feel like a fraud. For many of us, a financially secure, worry-free retirement no longer seems possible. Not to worry. I’m going to give you my best advice on how to create a very attractive retirement from what looks to be a seemingly impossible financial situation. After scaring you with some numbers in this essay, I’m going to spend the next installment telling you how to fix anything you may have been doing wrong. I’ll also give you some realistic suggestions for acquiring wealth—no matter how much you have to start with—while you are still willing and able to work for it. Finally, I’ll give you an idea for how you can retire very comfortably—and very soon—on a modest income. And by “modest,” I mean less than $40,000 per year. What Happened to the Dream? What happened, fellow boomers? How did we fail? Did we work too few hours? Too few years? Did we spend more than we should have? Or fail to save… or save too little? Did we invest poorly? 1. We worked hard, but we didn’t get meaningful wage increases. As a group, we boomers worked more than we were required to throughout our careers. Not only did we work more than 40 hours per week, our productivity nearly doubled between 1979 and 2013 (according to the Bureau of Labor Statistics). The problem was that, over the long haul, our wages did not keep pace with inflation. From 1948–1979, wages adjusted for inflation rose 93.4%, according to the Economic Policy Institute. The wage rate increases were beating the slow rise of inflation—big time. 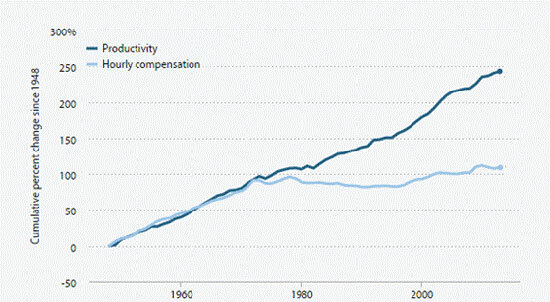 In 1979 (some sources say as early as 1972), wages went flat. For the next 35 years, as we boomers passed through our late teens, 20s, 30s, and 40s, real wages increased only about 8%. And since 2009, the tide has reversed. Real hourly wages are once again on the decline. So while our bills continued to rise, our take-home pay, in real dollars, didn’t—and still doesn’t—keep pace with inflation. 2. We saved less and less. According to various sources, the average boomer has had an average annual disposable income of $24,000. The problem is: We squandered a lot of it. Take a look at the following chart. 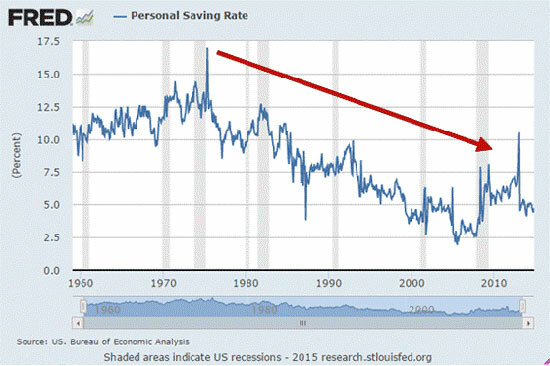 It shows the personal saving rate of Americans since 1960. As you can see, it fell from a high in the mid-1970s to 0.8% in the early 2000s. Since boomers made up 33% of the U.S. population during those years, it’s safe to say the general downward trend applies to us too. From our late teens through our 40s and 50s, we saved less and less. 3. We took on a lot of debt. 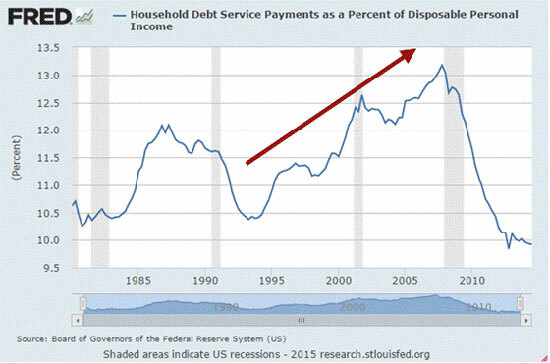 Here’s another chart, this one showing the household debt service ratio (DSR) since the 1980s. Notice how in 1980 household financial obligations represented around 11% of disposable income. That increased for over two decades. 4. We were poor investors. Based on analysis done by Pew Research and others, the average retirement-age American today has managed to accumulate a net worth of about $230,000. About $150,000 of that is socked away in some type of retirement account(s). Now, the average retirement-age American would have done quite well in his retirement account(s)… had he not let himself get in the way. You see, the S&P 500 has returned an average of around 11% annually since the mid-1980s. So, in theory, if a 35-year-old boomer would have parked $15,000 in the S&P 500 in 1984—and didn’t touch it—the stock market would have grown that to over $350,000. Instead, at the 3.7% return the average investor managed, that $15,000 investment in the stock market grew to just shy of $45,000. How is it even possible that so many of us managed to underperform the stock market by so much for three decades? We weren’t the smartest investors. Most investors—not just boomers—chase returns. They jump on a stock after it’s already made a big run. And they cling to a sinking one far too long, hoping for a turnaround. 5. We invested through some nasty market crashes. The crash of 1987 (when we boomers were 23–41 years old) was the first big shakeout. On Black Monday, the Dow lost 22.6%, or $500 billion. This was the largest single-day market crash in history. Then there was the bursting of the tech (“dot-com”) bubble in March 2000. From top to bottom, the Nasdaq composite lost 78% of its value from 2000–2002. Tech fund investors were hit even harder. I remember how confident some of my peers were about the tech market right up until the crash. Though they never told me the numbers, I know that a few of them were devastated. If you had jumped on the bandwagon and invested in tech funds at the Nasdaq’s high in 2000, you would have likely lost three-quarters of your investment just two short years later. 6. We still didn’t learn our lesson. Getting back to our love affair with debt—we made yet another critical mistake. Not only did we save less and take on more debt, we attempted to live well beyond our means. The real estate bubble burst in 2007–2008 and real estate prices plummeted. That triggered yet another stock market crash, which lost us many more millions. According to the Mortgage Bankers Association, as many as 3 million homes fell into foreclosure during the Great Recession. In some popular retirement spots, like Nevada, as much as 57% of homeowners still owe more on their mortgages than their homes are worth. Is What These People Did on Camera Even Legal? He owns a castle in France, but drives an old Ford F-150 pickup. He dines with billionaires overseas, but wears $10 jeans from Kmart. And he still works 10 hours a day, even though he’s 67 years old. But his latest decision really has us scratching our heads… he wants you to spend far less money with his business, but start enjoying much more research and benefits than ever before. You can see his explanation here. So here we are now. Given all of the above, things are looking bleak. And it only gets worse. As I mentioned earlier, the average retirement-age American today has a net worth of about $230,000. Around $150,000 of that is in one or more retirement accounts. Still, will these numbers support a comfortable retirement? Assuming a 3.7% average annual return (the average return of most stock investors), a $150,000 retirement fund would return $5,550 per year, or $462.50 per month. Now, keep in mind that this includes capital returns. Not just cash returns. So even if you wanted to spend this entire amount, it wouldn’t be possible (without selling some of your investments and facing capital gains taxes). But for simplicity’s sake, let’s just use the $5,550 number. Five thousand per year won’t buy you much in today’s world. And it will buy less each year as inflation erodes the value of the dollar. Luckily for most people, retirement accounts are only one source of retirement income. Social Security is another source. The average Social Security income for retired workers in 2013 was $1,306 per month, or $15,672 per year. So for the average person approaching retirement age, their retirement accounts and Social Security gets them to $1,768.50 per month, or $21,222 per year. For one in three retirees, a third source of income is pension payouts. The median private pension benefit for individuals aged 65 and older in 2013 was $8,612. The median government (state or local) pension benefit was $20,276. Put all that information together and retirees can expect an average monthly income of $1,700–$3,400 per month. What sort of retirement lifestyles would this range of income afford? The current median rent in the U.S. is $1,471. The average three-bedroom, two-bath apartment will cost you $1,300-1,700 per month. The average monthly electric bill for said house will cost around $107 per month. The average cable/internet bill is around $64 per month. The average annual golf club dues are around $520 per month. The average restaurant meal costs around $26 for two people, and retirees dined out an average of 193 times in 2013… or 16 times per month. That’s $418 per month on restaurants. The average annual budget for travel for retirees is $7,700. Retirees apparently plan to travel four times per year in their golden years (though I’m unsure how $7,700 will cover that). If we break it down monthly, that’s $641 per month. Basic housing expenses, a golf membership, a few meals out each week, and a trip every three months sounds pleasant enough… though far from luxurious. But here’s the problem: Someone earning an average amount won’t be able to afford this lifestyle on passive income alone. And we haven’t even considered gas, groceries, haircuts, gifts for the grandchildren, and an occasional movie. And what about health care? The average retiree should expect to spend $220,000 out of pocket on health care during retirement—not including long-term care. Let’s be conservative and say your retirement will last 20 years. That’s about $11,000 per year for health care, or $917 per month. Add it all up—assuming another $2,000 per year for the expenses we haven’t yet accounted for—and you’re looking at costs of about $4,300 per month, or nearly $52,000 per year. Keep in mind, too, that $52,000 is going to climb as inflation marches higher. If you’re just pulling from your retirement account to make up the difference, you’re going to run out of money several years before you die. Even if you’re earning on the high end of average, you’re still looking at a shortfall of about $1,000 a month. The return on your investments just isn’t enough to make up the difference. So let’s assume that you are nearing or at retirement age, and you can’t even come close to $52,000 in income. Or—forget that—what if you just want to stop worrying and stressing over your current financial situation altogether? I have some solutions. Five of them, in fact. Fair warning: The information on the next few pages might be difficult to take. But if you stick with it to the end, my bet is that you’ll feel a lot better about your situation. In fact, many of my longtime readers have taken this plan and broken free of financial worry completely. More importantly, you’ll have a plan of action. 1. Be realistic about what you can expect from stocks. First and foremost, you must recognize that you will not be able “make up” for the past by implementing any sort of short-term stock strategy in hopes of catching a big takeoff. No matter what investment service you use, you wouldn’t be able to double or triple your money in 10 years or less without taking wild risks. If you just had a portfolio that matched market averages, you’d only get 7–10% per year. Take the sum of all your stock investments and multiply that by 7–10% per year for, say, 10 years and you will have a realistic idea of what to expect. Write that number down. Don’t be tempted to make it bigger by telling yourself you will make 15% or 20% every year. It is possible that you could do that. But if you move all your money into speculative stock strategies, it is more likely that you will end up with much less than 7%. 2. Accept the fact that you may have to continue working. When your heart is set on retiring at 65, you may feel like working beyond that age will be a living hell. But it doesn’t have to be. I’ve retired three times so far (at 39, 49, and 59). And each time, I found that going back to work was a welcome relief. And I’m not only speaking from my own experience alone. I’ve advised many people to keep working in retirement and they have found a great deal of satisfaction in turning their hobbies and passions into second and third careers. You don’t have to keep doing the work that you have been doing. You might be able to move into a consulting or freelance position with your current employer. Or follow a dream and start your own business. I have dozens of ideas you could try… which I’ll tell you about shortly. But if you need to continue to work, you need to continue. The moment you accept that fact, the odiousness of working will dissipate. You might even be okay with it. Heck, you might eventually be thrilled with it. My view on this subject is that one should never give up active work entirely. That’s because work provides great and sustaining fulfillment. Especially if it involves learning something new or following a passion or hobby. 3. Develop an additional stream of income. Recognize another financial fact of life: the amount of money you have to save and invest, after you take away assets you plan to keep forever (like your house or your wife’s jewelry), is the single most important factor in building wealth. I call this your “net investable wealth,” or N.I.W. You won’t hear this from brokers or bankers or stock market analysts. They won’t say it because it shatters the myth that clever stock market investing is the cure for all financial problems. Fact is, stock investing alone can’t give you the wealth you need for retirement. Eking out a few percentage points on an investment portfolio will not solve your problem of needing more income now. You must increase your income by other means—none of which will incur fees and commissions from your stockbroker. And none of which will be subject to the sort of volatility the market is likely to face in future downturns. So how are you going to do that? How are you going to increase your income now, at this stage of your life? The answer may not please you, but you must come up with a strategy to make more money from a business you have or work for. You must also create a second stream of income. And this is so important that you have to find an hour or two every day to devote to making it happen. I am not going to tell you exactly how to do that here. But I’m going to suggest that you check out a program I created called the Extra Income Project. I’ve spent five years working with a team of people to develop a series of reports and how-to guides for developing income from a side business or hobby. All 36 of the individual income strategies we currently cover (plus another 10-plus we have in the works) are based on my own and my mentees’ personal experiences successfully earning money in this way. If you want to immediately make more money, I’m telling you: This is the way to do it. This is the fastest way to grow your income. 4. Consider—or reconsider—real estate investing. I don’t mean the kind of real estate investing that is advertised on late-night infomercials, but income-generating real estate investing. The kind of real estate investing that I do. This strategy will give you income almost immediately. And it may very well give you asset appreciation—which can add to your net worth considerably in 10 years or less. By the way, contrary to common opinion, you don’t need a massive investment to get into rental real estate. You can get started by pooling money with one or two friends and going in on a few properties. Really, to be a successful rental real estate investor, all you need is three things: money, knowledge, and time. This is true of most investments, but the good news is that with rental real estate, you don’t need a lot of any one of them. In fact, with the right deal, a partner, and leverage, you can get into a lucrative rental real estate property for as little as $10,000. Real estate is not difficult to understand. It is very much a simple supply-and-demand sort of investment. I have been able to make millions doing it and avoid the bubble without ever taking a course or getting a license or any of that stuff. 5. Retire this year on $40,000 or less. Finally, once you increase your income, your next step should be to decrease your expenses. Because there is a way to enjoy a dream retirement, even if your income is limited to $40,000 or less. Imagine, you wake up when you want to and spend a half hour walking on the beach. On the way back, you buy fresh red snapper from your favorite local fish vendor. You enjoy breakfast served to you on your private porch. Afterward, you work on your novel or you paint. Then you take a nap. You have lunch at your regular table in the corner. After lunch, you check on the money you made from your side business today ($500). Then you take another nap. In the late afternoon, you visit some of your friends. At sunset, you have drinks with your spouse at a beachside bar and listen to a young man play his guitar. Many of my friends are living this dream currently. And not because they’re rich. They’re able to live in luxury by moving abroad. What I just described to you is a typical day in Nicaragua for many retired American expats—many of them who started with a smaller than average retirement fund. Even in nice areas in Nicaragua, property costs and rents are low. Taxes are low. The cost of living is low. Health care is affordable, and the quality is on par with the U.S.
And here’s another great perk: There is no tax on a pension or any other money being brought into the country, as long as it was earned outside the country. You can run an internet business or any other business back home (refer back to points 2 and 3) and not be taxed a penny in Nicaragua. Imagine earning just $40,000 per year and enjoying this lifestyle. A little house five minutes from the ocean… housekeeping and gardening services year-round… access to wild, private beaches… spas and horseback riding for $10–$25 per hour… and day trips for less than $200. Wait a minute… doesn’t that sound a lot like the retirement you always dreamed of? I hope you’re starting to realize that even if things didn’t go as well as you’d planned over the years, it’s not too late to have your dream retirement. Far from it. If you do the things I’m suggesting to you today, starting with boosting your income, you’ll find that, instead of disappearing, your retirement account will grow and grow over the years. You’ll learn new things about yourself, acquire new skills, have fun, and have greater financial security along the way. All you need to do is start. Editor’s Note: As he mentions above, Mark has spent the last five years working with his hand-picked team to develop a series of essays, reports, and how-to manuals on ways he or his protégés have used to boost their incomes dramatically. Called the Extra Income Project, it gives over 35 unique methods you can use to start earning extra paychecks by this time next month. He says, “These opportunities are quick, easy, and don’t involve any stocks, options, or anything risky from Wall Street. Anyone can use these strategies to achieve the lifestyle they’ve always dreamed about.” For more information, click here. Get access to our very popular e-letter, the IM Communiqué. Submit your email for the free report and you’ll also receive, free, the International Man Communiqué, and Lobo Tiggre’s Speculator’s Digest. Access our very popular e-letter, the IM Communiqué, and our other guides and country reports. Get Doug Casey’s exclusive special report. A veritable treasure trove of intelligence, all at no cost.